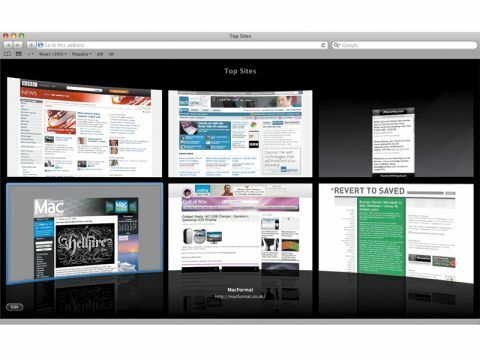 Apple claims Safari 4 is feature-packed and 'the world's fastest browser.' In reality, it's business as usual. Safari remains as elegant and efficient as ever, but maddeningly omits features that could make your browsing even better. The good news is Safari 4 is fast, often leaving the competition trailing. But new features are hit and miss. The web developer tools are excellent, and while the revised search and address fields don't match Firefox's equivalents, they draw on your browsing history to somewhat accurately complete URLs and terms. Elsewhere, Safari plays catch-up and attempts to wow with gloss. Its Top Sites page nicks Opera's Speed Dial, but presents favourite sites in a 3D view, also enabling access to Safari's full history search, which filters your browsing history to pages matching keyword searches. Annoyingly, results are presented in Cover Flow (often with blank placeholders), but a split view with a list is accessible via the History page. Cover Flow also makes a pointless appearance in the Bookmarks page, but Apple, for some unknown reason, hasn't seen fit to enable bookmark tagging. Nor does Safari offer iTunes-style smart bookmarks folders. Also, the browser's ad and content blocking remains pathetic, and the new progress indicator no longer indicates how much of a page has loaded. Despite these niggles, we still recommend it. There is excellent Mac integration, and is ideal if you just want a fast, efficient browser.